Don't let the relatively short distance and low elevation fool you, this race will push your endurance to the limit! Classic backcountry racing at its finest! Staged in Bruceton Mills, this course will test your climbing, tech skills and endurance. And not only is it singletrack, it’s freaking majestic singletrack. Brady's has a little bit of everything, from roots, rocks, stream crossings, short punchy climbs and big descents. The Gravel Race Up Spruce Knob is an adventure-cycling race on and around the highest peak in the Mountain State, Spruce Knob! This 6 Hours of Cranky Monkey is another edition of the Score three race series, held at Schaeffer Farms. 9 Hours of Cranky Monkey is a great race run on the closed-to-civilian trails of the Quantico military base, opened once a year for this race. 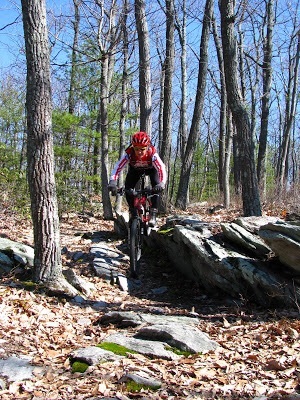 Rosaryville State Park is the venue for the third 6 Hours of Cranky Monkey race on its smooth, and ripping fast trails. Raced over 18 hours, this is a fantastic chance to do a relay on fun trails or test yourself as a solo racer. The best trails of the Woodstock area of Patapsco, wrapped into one incredible route is the perfect setting for this 6 hour lap race. With a touch of rocks, and fast laps, this can be a very fast course if the conditions are right. On the Rocks at French Creek is a lap format race with great singletrack that has plenty of rocks and smoother singletrack to keep you interested with plenty of climbing each lap to keep you honest. The Massanutten HooHa XXC is an endurance race for the all arounders. Run on the carefully maintained Fairhill trails, this fast race will give a racer a taste of everything: smooth singletrack, roots, log-overs, climbs and fast descents. Staged out of Vernon, you will get some classic New Jersey rocks and roots peppering this two lap race course. This lap format race at the junction of Maryland, Delaware, and Pennsylvania will leave no wonders about it's name. With plenty of rocks, singletrack and climbs, the Tuscarora 50k will give a little bit of every type of terrain to racers. The Terror of Teaberry is the third and final race of the three race Michaux series. The Curse of Dark Hollow is the second race of the three race Michaux series.